The Noonan Reading Room will remain open 24 hours/day for quiet study. Congratulations to the winners of the first annual Library Excellence in Research Awards. They receive monetary awards for outstanding library research, as displayed in research projects for class and in essays describing their research processes. Gabrielle is a psychology and art major, graduating this May. Her winning submission, Repetitive Transcranial Magnetic Stimulation as Treatment for Posttraumatic Stress Disorder, was written for PYSC 372. It is part of ongoing research. Elizabeth majored in English and graduated last December. Her winning submission, Narrative Devices and Readers’ Empathy in Dickens’ Hard Times, was written for ENG 428. It is available in Constellation, our digital repository of scholarship. Rosalyn is a sophomore majoring in Biochemistry. Her winning submission, Dealing with Transnational Environmental Crime, was written for ENG 102. It is available in Constellation, too. L-R: Felice Maciejewski, University Librarian; Rosalyn Wyse, Award winner; Elizabeth Cronin, Award winner, Caroline Sietmann, librarian and founder of Award; Sheila Bauer-Gatsos, ENG 428 Professor. Start thinking about applying for next year’s awards. All Dominican University undergraduate and master’s students enrolled in at least one class for the fall 2016 semester and/or the spring 2016 semester, including students who graduate in December 2016, are eligible for the award in 2017. Thank you to this year’s judges, Caroline Sietmann from the library, Ning Zou for the library, and Adrian Kok from the Graduate School of Social Work, and to Felice Maciejewski, University Librarian, for support of the award. Here’s what happening on campus this week in celebration of Earth Day. See the calendar in PDF: DU Earth Week Calendar. Student posters will be up in the Parmer Atrium all week. Did you ever wonder how much water can be conserved, money saved, grain rerouted to the hungry, saturated fat avoided, and environmental methane thwarted – just by cutting 5 oz. of animal product foods during a week or by changing our diet for a day? Will you join other DU people in going meatless and/or changing your diet for an entire day? Let’s see what we can accomplish together. Join the pledge in the Dining Hall. Then, after Earth Week, we can see the collective results of our FOODPRINT PLEDGE. Quantifiable results will be posted on Campus News. Join us now and take the FOODPRINT PLEDGE! Students! We want to know what sustainability efforts you think Dominican University should support. Join Sustainability Coordinator Cathy Nichin, Eco Club Advisor Mary Sadofsky, and special guests on this campus walking tour highlighting green initiatives and milestones in Dominican’s history as a pioneer in sustainability. It’s a great way to find out what we’ve done, what we’re working on, and what you can do to get involved. about sustainability opportunities in the local community and test your composting knowledge. Transportation will be on site to share more about basic bike upkeep + offer an intro to the Dero Fix-It bike repair station on campus. Student participants will earn lots of chances (raffle tickets) to win sustainable giveaways. Campus partners: OSI, Sustainability Coordinator & Eco Club. Sustainability is a compelling and powerful social cause, but did you know that it can also be a vocation and career? Learn about internships and job opportunities with environmental organizations, companies that provide sustainable products and services, and companies with strong commitments to sustainability. Discover more about Native Landscaping with Pamela Todd from West Cook Wild Ones. RSVP to cjnichin@dom.edu. Who pays the price for our clothing? Come watch the groundbreaking documentary film that pulls back the curtain on the untold story of the fashion industry. Learn more about the harm that fast fashion causes to the environment, and gain some resources for shopping more eco-friendly. It’s spring cleaning time! Bring your unused and unwanted clothing items to the CTLE to donate. Meet in 115 Parmer for snacks and a talk by biology professor Margaret Jonah about her recent visit to the Galapagos Islands, site of Darwin’s crucial insights about natural selection, in 1835, and currently home to a fragile and threatened ecosystem. Then set out on a pre-sunset walk with biology professor Scott Kreher to enjoy Dominican’s natural beauty and contemplate our place in the local ecosystems. Return to Parmer for refreshments. Please RSVP here. Participants depart from the front door of Lewis Hall at Noon and walk to the Trailside Museum of Natural History – approximately 10 minutes by foot. Meet with a Naturalist of the Cook County Forest Preserve for a brief talk and short guided hike Enjoy trail mix + snacks along the way compliments of the Staff Healthy Living Committee. Opening day at the Priory Garden – help ready the garden for the planting season! Garden supplies will be provided. Many hands will make work light. Come during your lunch hour or at the end of your day. Refreshments will be served 3-6PM. Celebrate the close of Earth Day by getting your hands dirty in the garden, socializing with students, faculty and staff, and enjoying some refreshments before heading home on a lovely spring evening! Participants are encouraged to walk, bike, or take the DU shuttle, which leaves the main campus on the hour and 20 and 40 minutes after the hour. Please RSVP here. On Saturday, April 16, Dominican hosts the Spring Conference of the Illinois Conference of The American Association of University Professors. Welcome to all attendees. The theme of the conference is Free Speech, Adjunct Rights and the Taming of Corporate Higher Education. The conference runs from 8am to 4:15pm at the Priory Campus, 7200 W Division St.
We are all suffering from the budget impasse in Springfield. The MAP Grant Program has not been funded. It is now our turn to rise up and have our voices heard! Student Government, University Ministry, and First in the Family are gathering student support to go to Springfield and force the politicians to hear us. WE NEED YOUR HELP! -Depart Springfield for Dominican University. If you are interested please sign up using the google doc link: http://goo.gl/forms/LDfGDJs7t2. Once you complete the google doc, a waiver will be emailed to you. Please fill the waiver out. In addition, there will be a table located in the Lewis Alcove where you can sign up to attend the rally. There will be an important organizational meeting on Wednesday, April 13, in Crown 310 at 4:30 p.m. Students are encouraged to attend this important rally. HAVE YOUR VOICE HEARD! GET YOUR MAP BACK! Looking for a movie dealing with peasants, knights, and the rise to fame and glory—with a twist of 70s rock music as the soundtrack? We recommend A Knight’s Tale, starring Heath Ledger. 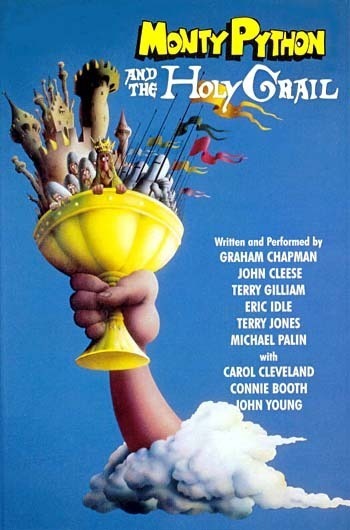 If you’re looking for a comical version of King Arthur and epic quests, then we recommend the very funny Monty Python and the Holy Grail. Feel like watching a classic, silent, religious film about a young woman who stands up for what she believes in? We recommend The Passion of Joan of Arc. How about an epic historical drama dealing with the Crusades, starring Orlando Bloom? We recommend Kingdom of Heaven. If a movie about a knight playing chess with Death in order to keep his life sounds interesting to you, watch The Seventh Seal. Do you like hobbits, dwarves, Grey Wizards and orcs? If so, then we strongly recommend The Hobbit and The Lord of the Rings. Stop by the Media Center and we’ll help you find a movie to fit your medieval cravings. Thank you to Jessica Barth for these recommendations. We are still experiencing firewall issues with our EBSCO databases (Academic Search Complete, Communication and Mass Media Complete, and others) and are working to correct the problem. If you use more than one search term you may get a connection error and will not get your list of articles. This seems to only happen on campus. As a temporary workaround, you can change the Search Modes option on the Advanced Search Screen. Under Search Modes, choose Boolean/Phrase. Then type your multiple search terms in one search box above. See the image below. Thank you for your patience. Databases from ProQuest and other vendors are working normally.